The tariffs that ZESCO proposes to revise on Labour Day are outrageous, unthinkable and an insult to the labour movement in Zambia, says Green Party President Peter Sinkamba. Reacting to a ZESCO advert which appeared in the Zambia Daily Mail yesterday on Friday, 22 March, 2019, Mr. Sinkamba said it is a pity that the Zambians have been taken for a ride by parastatals like ZESCO who have capitalized on the docility of the general populace to make ‘hay while the sunshines’. “You see, the generals populace sacrificed at great cost to recapitalize ZESCO through the Eurobond loan in 2012 running in hundreds of millions. We were promised that once the recapitalization of ZESCO is complete, then power would be cheaply available to the Nation. That was a plausible sacrifice the Zambians populace made. “Now, seven years down the line, ZESCO comes with weird excuses to justify the more than 300 per cent increase. According to the advert, the ZESCO Managing Director says the cost of power from new generation infrastructure is much higher than the cost of generation from old depreciated power plants. This statement is an insult to the intelligence of Zambians. 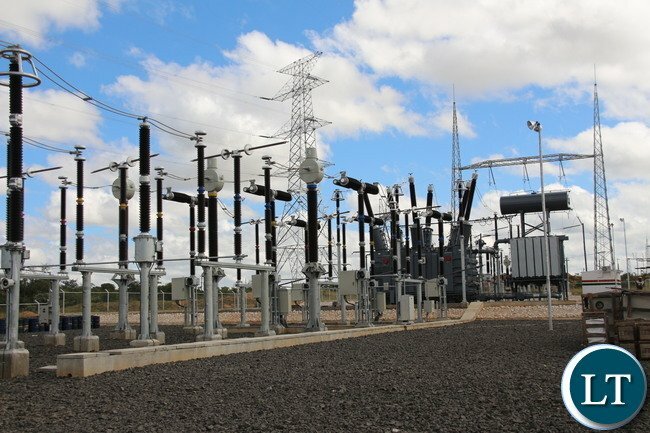 If old depreciated power plants are producing cheaper power than the new power plants, then that is admission of incompetence deserving immediate dismissal of management and board of ZESCO. “This is clear admission that the new equipment and infrastructure procured from the Eurobond and Chinese loans is sub-standard, hence the higher generation costs. Under normal circumstances such incompetence deserves instant dismissal of all management and board of officials involved. Under normal circumstances, new equipment must be more efficient and cheaper to run. “What makes it as a worst insult ever to the labour movement is that ZESCO has proposed to revise the tariffs on Labour Day. This is an unthinkable insult to the workers. Where are the workers going to get the money from to afford the 300 per cent increase when Government has approved a paltry 5 per cent salary increase and those in private sector such as miners are facing redundancies and other forms of lay-offs? “To add salt to an injury, ZESCO is mocking the workers by introducing a so-called bulk distribution tariff which is lower than the average residential tariff. The implication of this measure is that workers will start subsiding businesses and industries. This is the proverbial adage where the rich will be given more, and for the poor, even the little they have will be taken away to give the rich. This is so appalling, so nauseating,” Mr. Sinkamba said. He has called upon President Edgar Lungu to intervene and stop the ZESCO insults to the Zambian people. “I think the Zambians deserve better than this,” he said. Mr. Sinkamba said the excuse by ZESCO that connection fees have not been changed since 2005 is utter rubbish. He said the cost-reflective tariffs system was introduced by ZESCO almost three years ago. He said pricing principles require that networks develop cost reflective pricing, based on calculating the long-run marginal costs of supply. At its simplest, this is the cost of supplying the next unit of energy if the network were to be augmented or capacity is increased. The system addresses the supply network holistically, and that was done three or four years ago. “How on earth do you increase connection fees from K769 to K3,126? That is lack of sensitivity of the part of ZESCO board and management. Where do you expect workers and unemployed people to get such colossal money? For those on minimum wage, it means sacrificing entire salary for the month to connect to ZESCO only? “What are you encouraging? You are encouraging corruption in workplaces, theft and burglary, deforestation, illegal tapping of power, and what not. This is total madness. And to make matter worse, the ZESCO Managing Director says the company is doing all this in the quest to achieve Millennium Development Goals of reducing poverty by half. First of all, at a level of Managing Director, Mr. Mundende is expected to know that MDGs agenda ended four years ago in 2015. This means the man is lost. Now, we are three years into the Sustainable Development Goals agenda. No wonder what he is doing at ZESCO is clearly not sustainable. The man is totally lost. He doesn’t deserve to be where he is,” Mr. Sinkamba said. When government turns ROGUE, the case of pf. The only problem is that Sinkamba never hold rallies or Press conferences. Is he coward, scared of being arrested? It’s true, Zambian populace is like a beautiful retarded who get r^ped by own relatives. Someone need to rescue domicile citizens, now even Zesco is abusing you even broad daylight? … in Government have continued to siphon funds from beleaguered parastatals like Zesco, it is very very unfortunate to say the least. OPEN UP ZESCO TO COMPETITION. CUSTOMERS KINLY RESORT TO RENEWABLE ENERGY SOURCES. I asked myself questions as to how and why a company could be on top of the mountain calling people to switch and serve. Depending on which side of the business you are, the switch and save compaign doesn’t make alot of sense and does/did make alot of sense. Zesco doesn’t need a makeshift solution to its problems. It being a national asset, very important one at that, needs medium to long term serious nonpolitical strategies so that posterity doesn’t judge us negatively. Zesco needs operational audit. Zesco business needs to rewrite its business model. Zesco needed a serious competitor like yesterday. Zesco would wind up like beleaguered Zamtel. And some foooools were clapping when ZESCO is being used to channel funds by Chink Transformer manufacturer and Lungu in form of a Technical School in Petuake. This is the price of corruption being passed down to you…they told you last time that they will increase three times and its final but they are at it again. Wake up from your docility!! Seems we do not understand basic human rights. Mr. Sinkamba is right. Zesco must be investigated. I have a feeling there’s a very serious scheme at the firm that is just up to de-campaign The Government of the patriotic front. For what is their main objective to increase tariffs at these abnormal prices? At the current slim disposal incomes of 80% of the Zambian people almost nobody will be able to afford such prescribed tariffs. In this case we earnestly appeal to our beloved President to intervene before these merciless management at zesco kill the moral fibre of our beloved GOVERNMENT. PF Central Committee headed by Grade 7 failure? PF appointed I.G. of Police? Wake-up and accept stark reality of the cost of PF “unprecedented development” from September 2011 to date. You are certainly a blinded f00l who cant correct his own mess but tries to see the wrongs of others. Look at what your ka disgraced HH has done to UPND. The chap has held all of you in his tiny palm and you cant challenge him of the failures your party? You can accuse President Lungu of this and that but as long as you have no evidence, its malice. But whats true and documented is , HH has ruined UPND and until you come to terms with it, forget anything good out of it. These are issues worthy demonstrating about! Where are the pressure groups in this country?? Peaceful demos must be organised country wide to make sure the point is driven home. If this Zesco MD is as lost as Peter puts it, then you just wonder want the heck his doing on that hot seat??? The cost of leaving is already sky high and this Zesco wants to add insult to injury,this should be stopped!! Enough is enough! When you dont have enough money, you cut expenses and follow a strict budget, but not in Zambia. The nation is broke but people still buy luxuries and expect the ordinary citizen to continue offsetting the bills through high taxes and bills. This should not see day light!!! Quite regrettably, there are no pressure groups in this country worth their salt. Even the opposition political parties cannot be counted upon to speak for the common man as their sole agenda appears to be to get into State House. Jean Bonheur you’ve truly said it well. No where to run to. Trade Unions are all dead. This should be their call. “He has called upon President Edgar Lungu to intervene”. President Sinkamba, are you bonkus? Zesco is a government parastatal, you don’t know that? And government is called PF Government, you don’t know that too? ….. you surprise me ba president Sinkamba … kikikikikiki.. Enjoy yourselves. Some of you are even blaming opposition parties when you know that this government of yours is a dictatorship. Zambians have been arrested in a church for attempting to discuss budget. Demonstrators have been shot at while students are tear gassed to death and you blame Zambians for docility? Just enjoy the Pf bed you spread for yourselves please. Enjoy the proposed Ratsa tarriffs. Enjoy. Most things under PF have become outrageous and nonsensical, nothing is making sense; and these are the traits of a regime on its way out and unfortunately UPND isn’t a logical alternative. All financial transactions under PF are unreasonable because of the greed of those in charge, Edgar is a lame duck, he can’t do anything. Zesco must be unbundled, let it remain with the generation function alone; domestic power supply must revert to local authorities, bulk and industrial must go to other entities. Why are some bulk consumers paying below cost? Power generation and distribution is too big for a single directorate, especially under a PF cadre like Mundende. Zesco can’t account for most of the power it generates and these are the consequences. Anyway, go ahead and increase we will speak through the ballot. Is there anything reasonably priced under PF? Eat and be merry, Sata killed the elephant and the carcass is still big, take your chunk Edgar will not notice his lieutenants have blinded him. What advice can you get from Freedom except that boss filifye bwino? It doesn’t have to be political. Just ask them to justify the increase and once they fail to explain, we urge the ERB to nullify their proposals. Sinkamba is 100 trillion % correct on most parts. We can fight it. We don’t have to be political but simply practical. Zesco has always used the increase in fuel price as an excuse to increase their tariffs. This time around the price of fuel has gone down albeit by small margins and the sensible thing to do is to reduce tariffs pro rata. …… I’m not condoning the increase, just encouraging my brothers and sisters to look at the big picture. …… Collages and universities should also stop being lazy and should look to encouraging foreigners to enroll by marketing themselves to neighboring countries like Angola, Mozambique, Tanzania and Congo. You can’t expect govt to continue paying your bills all these years a subsidy is a Grant that subsidizes your income it’s not meant to be the only income you get. Many of the leaders in Government are good colleagues and friends and that’s why I encourage Lusaka Times to put an end to insulting bloggers because this should be a place for those in power to read and pick up on good governance ideas. This is a role the media plays in democracy not fueling bitterness and divisions by allowing the use of insulting language and labels when referring to leadership especially the president. Sinkamba is right, let the Zambians especially those that were busy with “umuntu ni lungu” and cannot even afford a bag of mealie meal, feel the pinch! Zambians are enemies of self! Zesco has indeed flourished on docility of the masses. What are you complaining about? Where do you think money to repay the loans is going to come from? Lazy Zambian just like complaining. We need to pay more taxes on electricity tariffs, bore tax, health insurance tax, toll gate tax and we need to introduce more taxes so that we can borrow more and make the roads. As we do this I urge the govt not to increase salaries because this will cause inflation.